The BEST homemade Mint Brownies from scratch! 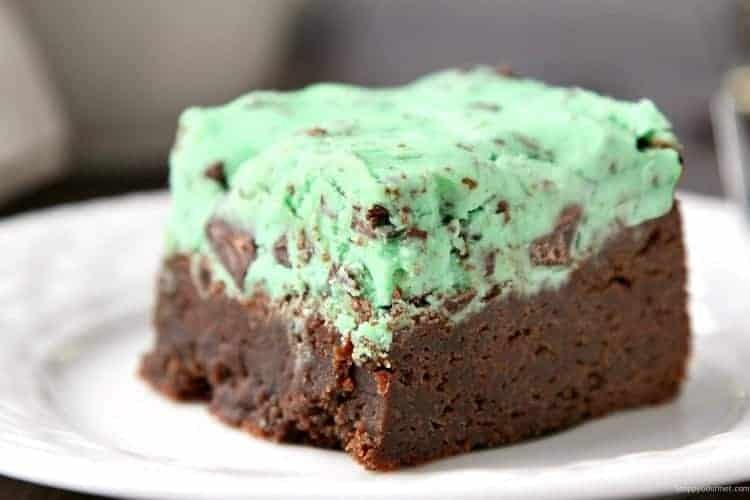 A chocolate fudgy brownie recipe with an easy mint chip frosting. 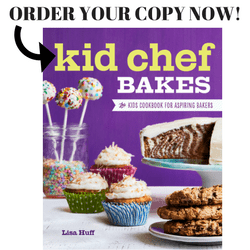 Learn how to make brownies from scratch without a box that are simple and delicious! Be careful though, these gooey brownies are sinfully addictive! Oh boy, I think you’re going to love me and hate me for this easy Mint Brownies from scratch recipe! These brownies with mint frosting are sooo good that it may be hard to only have just one little one. Don’t say I didn’t warn you, haha! I do love brownies, and these are right up there at the top with my Peanut Butter Stuffed Brownies and Turtle Brownies! Who doesn’t love homemade brownies? Although brownie mixes have come a long way, these rich and fudgy brownies are the best with easy brownie ingredients! For best results be sure to buy the best quality ingredients you can afford, especially the chocolate and butter. Preheat your oven to 350 degrees F and lightly grease a 9×9-inch baking pan or you could also line it with parchment paper. I like to use parchment paper so you can easily lift the brownies out for cutting. Melt the butter and chocolate chips together in the microwave or double boiler until smooth. Cool completely! In a bowl, mix together the eggs and granulated sugar until well combined then the vanilla extract. You could also add a little mint extract if you’d like. Once your chocolate and butter is cool, beat or mix it into the eggs and sugar. Make sure your chocolate and butter is cool. If it’s hot, it will cook the eggs and you’ll end up with scrambled eggs. Beat in the dry ingredients including the baking powder, salt, and flour. You can mix the dry ingredients together in a separate bowl, and probably should for best results, but I was in a hurry. haha! Pour the batter into the pan and bake about 30-35 minutes. Cool completely before frosting! Instead of taking a bunch of step-by-step photos I took a video of everything (below) so you can see all the steps. Scroll down for the full printable recipe card as well. 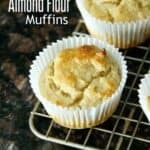 The small amount of flour in this recipe helps make them more chewy and gooey rather than cakey. Halfway through baking, if you’d like, you can remove the pan from the oven and tap it on the counter to help get rid of any air bubbles. Don’t make any ingredient substitutions. Making substitutions can result in a very different brownie. When the brownies are completely cooled (yes I know I just said that, but it’s really important), make the frosting. You may want to add more or less mint extract depending on how much you like mint. For the chopped chocolate, I bought chocolate chunks (near the “chips”), and chopped them on a cutting board with a sharp knife. You could also use chocolate chips or mini chips but I personally like the small chunks. You could also chop up some chocolate bars (leftover holiday candy perhaps?). The frosting recipe makes a lot of frosting! Ok maybe not THAT much, but it does make a nice good thick layer of frosting on the brownies. If you just want a really thin layer of frosting, cut the recipe in half. I loved the frosting so can’t imagine using less, but that’s just me, ha! If mint frosting isn’t quite your thing, maybe vanilla or chocolate. 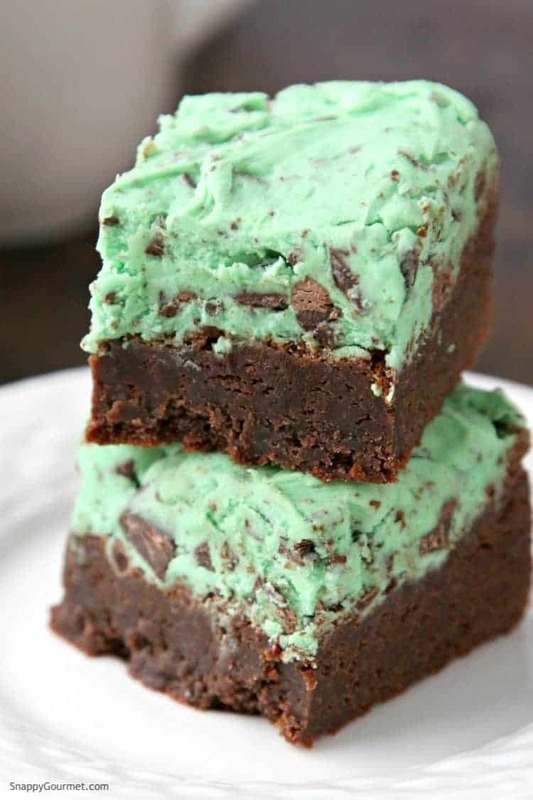 These homemade Mint Chip Brownies are rich and decadent, so small squares are probably best. But who am I kidding, big pieces would be great too. To easily cut the brownies, put the pan of brownies in the refrigerator for a few hours if you can wait that long. Cut into 36 small squares or as big as you’d like. COVER PAN – The easiest is to just cover the pan and place in the freezer. Best to place a cover RIGHT on the frosting so there’s no air. This can get a bit messy though when you defrost them. 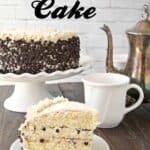 COVER BROWNIES – You can remove the brownies from the pan and place on some plastic wrap (or silicone mat, parchment paper, or wax paper) on top of a large baking sheet. Place the pan in the freezer and once frozen, wrap tightly with plastic wrap and wrap in aluminum foil or place in a sealable bag or airtight container. If the brownies do not have frosting, you can wrap them right out of the pan and freeze. FREEZE SLICES – I like to cut the brownies into slices then place them on a silicone (or you could use wax paper, parchment paper, or plastic wrap) lined baking sheet. Freeze until frozen, then place in a bag and remove as much air as possible. 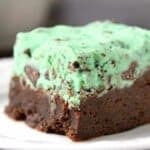 These Mint Brownies are the perfect green dessert for St. Patrick’s Day (March 17th) or National Brownie Day (December 8th) or just because you like chocolate and mint. haha! 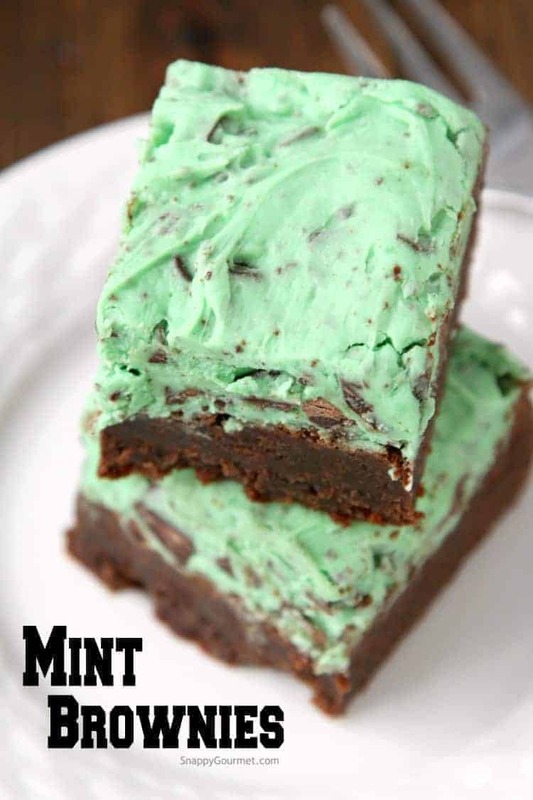 Hope you enjoy this Mint Brownie recipe as much as we did! If you’re looking for fun mint recipes check out my Mint Graham Cracker Toffee and my Thin Mint Martini! In a large bowl mix together eggs and granulated sugar with a whisk or an electric mixer on medium speed until well combined. Beat in vanilla extract. Beat cooled chocolate and butter mixture into the eggs and sugar until combined. 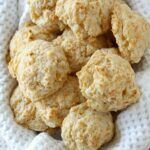 Beat in baking powder, salt, and flour until just combined. Pour brownie batter into prepared baking pan. Bake brownies for about 30-35 minutes or until toothpick inserted into middle comes out clean. Cool brownies completely. For frosting, beat together 3/4 cup softened butter and powdered sugar with an electric mixer on medium speed. Slowly add milk until frosting consistency. Beat in mint extract and desired amount of green food coloring until well combined. Stir in chocolate, then spread over cooled brownies. SNAPPY TIPS: Be sure to cool the butter/chocolate completely after melting before adding to batter. Also, be sure to cool the brownies completely before frosting. To easily cut the brownies into squares, refrigerate the brownies for a few hours. SNAPPY SUBSTITUTIONS: Instead of semi-sweet chocolate you could use dark chocolate or bittersweet. Instead of, or in addition to, the vanilla extract in the brownie batter you can use mint extract. This post was originally published on February 16, 2017, but was updated and republished on March 5, 2019. 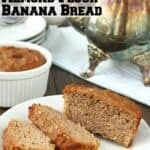 The recipe is basically the same, but more information was added and photos updated. This is such an amazing treat! Can’t wait to give it a try! Just trying to convert this to metric. 1 cup of butter. Is that about 250g? Reminds me of mint chocolate chip ice cream! Yum! 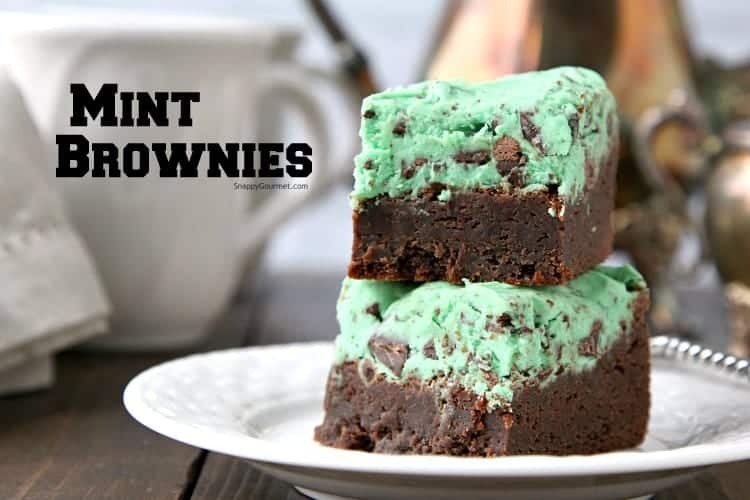 I’m a big fan of chocolate and mint and just know these would go super quickly in my house – I’m not sure I’d actually be willing to share them, yum! That looks amazing. I love the green color. 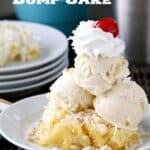 I’m not a fan of peppermint I know someone who will love this recipe. Sharing it with her. Fudgey Brownies are my most fav. & thank you for making them minty! Why are these not in my kitchen right now?! These look (and smell I’m sure!) amazing! These brownies look amazing! 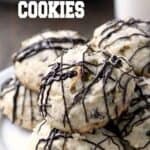 We’re huge fans of mint chocolate chip ice cream in our household, so these look delicious!